I don't know why they call this park death valley, but this long, thin valley is North America's lowest and driest place yet alos one of the most fascinating. Winter is mild, spring brings out spectacular flowers, while summer provides bragging rights for those who experience the desert heat! In warm months, daytime temperatures frequently top 100 degress. It went even as high as 134 degrees fahrenheit at the aptly named Furnace Creek - just 2 degrees shy of a later world record in the Sahara Desert. 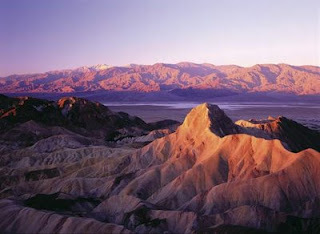 This national park has 3.3 million acres of deserts and mountains located on the border between California and Nevada. It has bone-dry salt pans, shifting sand dunes, wind-scoured canyons and giant alluvial fans resembling rock rivers tumbling onto the arid valley floor. Death Valley is North America's lowest spot at Badwater Basin, 282 feet below sea level, the driest place averaging less than 2 inches of rain a year. It must be an interesting place to visit. I am curious about getting its history and getting to see what's in there. Maybe someday :).